How Can I Go DFW Vintage Toys? Where is DFW Vintage Toys in Carrollton on the Map? AMAZING!!!!! Every once in a while I run across a hidden gem and this is definitely one of them!!!!!! It is the coolest toy store I have ever been to -truly one of a kind!!! No matter how old you are you will find something that you absolutely love; whether it be from your childhood, your parents, grandparents or Better yet something you wish you could have had when you were a kid... Well now You can find it here! 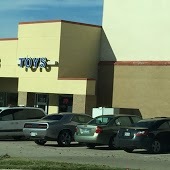 this the ONLY vintage TOY store I have found that actually buys your toys and doesn't like wholesale buy anything! How awesomeis unb is that! On top of that the staff is unbelievably friendly! they have three different rooms it's so much bigger than I thought! if you haven't gone here it's a must! I'm in love!!! This shop is one of the coolest toys stores I have ever been to. The owner, Jayden, is an awesome guy who loves what he does and will always work with you to make a deal. Vintage toys are always fun to look at as they take me back to my childhood. This is my favorite toy store and I recommend it to anyone. This store is all kinds of awesome! I haven't seen so much vintage Star Wars, GI Joe, Transformers, and Masters of the Universe stuff in one place since I was a kid in the 80s. There are rooms full of DC and Marvel goodness, WWE figures, and 70's Mego figures like The Dukes of Hazzard. There were also Kenner Indiana Jones toys and Galoob A-Team figures!! What a great store! Awesome new toy store!!!! spacious room packed with goodies wall to wall. The employees are really nice. I also shop at their Traders Village shop when I am there. Thanks for having this store for us old collector nerds. See ya soon!!! !